Supposedly there are tech specs on the Nike LeBron 13 floating around the web. While we’re unable to confirm that these are indeed accurate, we can at least have fun speculating. 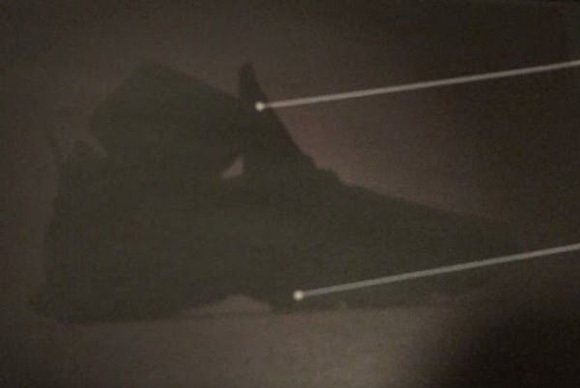 The silhouette of the LeBron 13 was part of the leak and they look…funky. I know we can’t say anything concrete at the moment, since we don’t really see the shoe, but they look like they’re geared for on-court use only. But you never know, somehow Nikes seem to do fairly well off-court as well as they do on-court. Now for the tech. Looks like we’ve got some new stuff going on here; the cushion is stated to be Hex-Max which is larger and more articulated than the 12’s Hex Zoom. I think this just might be a redesigned Hex Zoom system, but think of it as the 12 version on steroids. You know…built for a LeBron sized athlete. That’ll probably mean that the units are much larger volume than the last round and according to the info, more flexible as well. It also states linked propulsion. 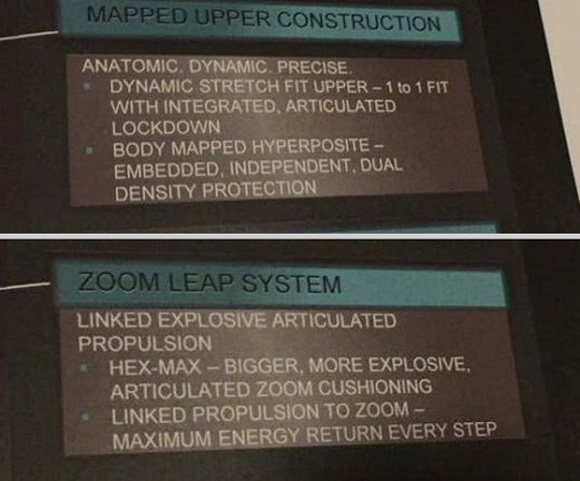 Some might consider this similar to the Flight Plate, but I think the Zoom units will be connected to one another the way original articulated Zoom Air was. If that’s true then it should be one hell of a ride. The upper looks to be a new material as well. There is going to be mapped Hyperposite, which we’ve seen on the last two models, but this time it’s stated as dual density. In case you were unaware, Posite is PU – or polyurethane – which is the same stuff that old school midsoles are made of. It’s a much lighter and thinner version of PU so it molds with heat and moisture when worn. Having a dual density setup might mean that we’ll see heavily structured areas for reinforced support – ankle collar and midfoot – while other areas are much thinner with greater ability to mold to the foot quickly, possibly the heel and forefoot areas. All of these processes seem as if they’ll all work in tandem with one another. Then the Posite will join with a Dynamic Stretch Upper with articulated lockdown. Honestly, that sounds just like TechFit from adidas so I’d expect something similar. Those are pretty much my thoughts/ interpretation on what was given. What do you guys think? Performance beast or too much tech? I was thinking about getting a pair of 12(since prices dropping) but now I don’t know. I might have to wait for these. Definitely a gimmick, but I still love the cushion and most importantly flexibility with the Lebron 12. They are the first Lebrons I am still enjoying today since the 9 Elites. I think that Nike is doing their best to ruin the best athlete in the games career, that’s what I think. Make the man a solid shoe that he can play through the whole season in and cut it out with the experimentation, which obviously hasn’t worked for the past two seasons. The so called Elite shoe hasn’t worked, and LeBron had to wear insole from FootCare Express the whole last season, in order to play in the 12’s. He wears orthodics either way. He wore the 12’s just fine. I know personally that he had issues early on in the season with the 12, and I personally know that he did not wear that particular insert last year. Now, with all do respect, you are NOT talking to someone who does not know what he is talking about. And I know that you know that you DON’T know that we know that you know that I know that you don’t know what you’re talking about but I know that Nightwing knows that you know that I know that I know. Yeah, okay. Knowing how nike tries to control narrative on popular sneaker websites, and also knowing that Nike could not modify the 11’s well enough for LeBron’s “orthotic” last year, I understand why Nike would not want to take another hit as to why LeBron needed a few weeks off this past season in order to get reconditioned, being able to recover, then using the new inserts. Nike has begun to make LeBron’s shoes for five foot eleven, a buck sixty pounder’s, instead of making them for LeBron James. There are already leaked images of the Lebron 13 outsole which show 4 Hex Zoom units in the forefoot and possibly one large Hex Zoom in the heel. Very similar to the 12’s. The traction pattern is different on the Zoom units compared to the rest of the sole, again like the 12’s, and it looks “iffy” at best. But, it is only an early look. I do like the leaked silhouette image though. I feel like I understand what SECULAR HUMAN is talking about elite players such as Lebron, Kd, & Harden have been retreating to their last nike models due to complications.. Not saying the consumers would have the same issue. Personally I’m just waiting for the day that nike isn’t the dominate shoe company. It will be a interesting transition if it would ever happen but I doubt it will in a long time. Meh… We could speculate all day about new arrangements of the same tech or even new zoom or max units but as always it will come down to fit and traction. If I can catch a non lizard puke color on sale and reviews are excellent I will consider it. I am actually excited that Nike is trying to give us new tech. I hope this constitute a 15% price increase. I am really looking forward to the KD 8, Lebron 13, Jordan 30, and J Crossover 3. Also, if the Harden 2 is for real and on full length max zoom. I feel the Lebron 12s are really good to play in especially for the discount price you can find them at. Even the 11 was pretty good once the posite broke in. Excited to see the progression in tech from Nike, Jordan, Under Armour, and Brand Black. “doesn’t” constitute a price increase. Speaking of Polyurethane, what’s the differences between that and the current EVA/Phylon that Nike use? Did other brands use polyurethane for their midsoles too? Why did they stop using polyurethane for the midsoles? I might have to do some Googling when I have some spare time and try and read up on it. Why not max air like the x’s? Hi, could you please give me the weight of Nike lebron 13?